Good Morning, this is Capital Essence’s Market Outlook (the technical analysis of financial markets) for Thursday December 6, 2018. We’ve noted in the previous Market Outlook that: “this week’s bullish breakout had helped putting the bulls back onto the driver side of the market but it doesn’t mean that we’re out of the woods. Over the next few days, we will look for trading behaviors as the S&P probes key technical resistance near 2815. The market had historically developed minor resistance near that level. There is no reason to turn particular bullish until this zone is eclipsed.” As anticipated, S&P tumbled 3.2 percent Tuesday amid ongoing concerns that the U.S. and China won’t be able to settle differences over major trading issues in the next 90 days. The Dow Jones Industrial Average lost 3.1 percent and the Nasdaq Composite lost 3.8 percent. The CBOE Volatility Index (VIX), widely considered the best gauge of fear in the market, surged more than 26 percent to 20.74. Regional banks were notable laggards amid worries about lower mortgage loan demand. Toll Brothers (TOL) reported a moderation in demand in its fiscal fourth quarter ended October 31. The SPDR S&P Regional Bank ETF (KRE) tumbled 5.5 percent on the day and is down more than 10 percent YTD, underperformed the S&P by a wide margin. Now the question is whether recent selloff is a beginning of an end or there’re more pains ahead? Below is an update look at a trade in KRE. Our “U.S. Market Trading Map” painted KRE bars in red (sell) – see area ‘A’ in the chart. The first dominant feature on the chart is the rising trend line starting in early 2016. The second dominant feature of the chart is the downward trend since early 2018. 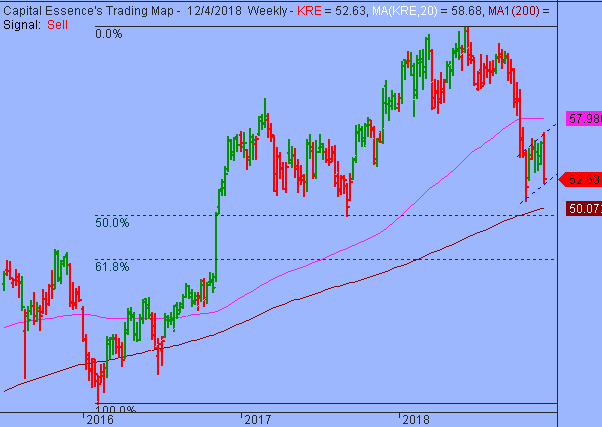 Over the past few weeks KRE has been trending higher in a short-term corrective mode after the September selloff found support near the 4-year moving average and the 50% Fibonacci retracement. The late October counter-trend bounce ran out of steam near the 2-year moving average. This week’s massive selloff signify a bearish reversal. Right now follow-through is the key. 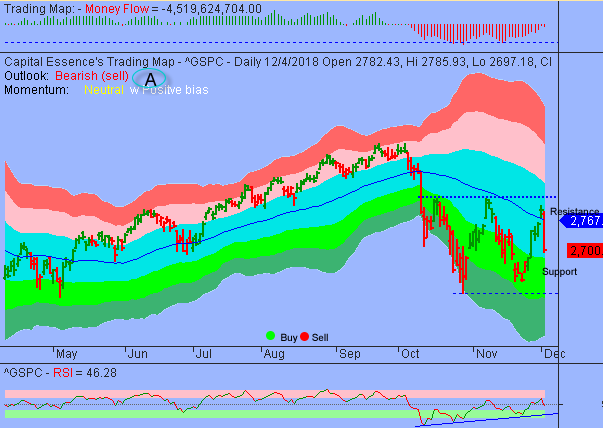 A close below 52 on a weekly basis suggested that the 2-month bearish flag pattern had resolved itself into a new downswing and a test of the more important support near the 50-45 zone should be expected. KRE has resistance near 56. Short-term traders could use that level as the logical level to measure risk against. Short-term technical outlook shifted to bearish (sell). Last changed December 4, 2018 from bullish (buy) (see area ‘A’ in the chart). The most important technical development in Tuesday’s session was that the S&P broke down below the trend channel moving average after climbed above that level on Monday. This is bearish and can be a harbinger of near-term weaknesses. However, despite Tuesday’s massive selloff, Money Flow measure is at the highest level going back to early October, suggesting that the bearish breakout could be just another noise (read: fake-out). So unless there is a serious downside follow-through that takes out the 2700 level, we could be range bounce from here into the end of the year. As for resistance, if the October and November recovery highs, near 2815, is taken out on a closing basis, then the door is opened for a retest of September highs but it’s not expected this week. Short-term trading range: 2600 to 2767. S&P has support near 2700. A close below that level has measured move to 2600. The index has resistance near 2767. A close above that level could trigger acceleration toward the 2815 zone. Long-term trading range: 2660 to 2930. S&P has support near 2670. A close below that level on a monthly basis has measured move to 2350. The index has resistance near 2750-2800. A close above that level has measured move to 2930. In summary, S&P broke key supports Tuesday, signify a bearish trend reversal. While the near-term technical backdrops favors further short-term weakness, it will be important to monitor the retreat and rebound behaviors to determine whether breakouts are decisive. In a longer term, there is a high probability of a period of consolidation activity between S&P’s 2600 and 2800 that might last several weeks if not months. This consolidation band provides a rally and retreat trading environment for traders. However, market is volatile and tight stops are advisable.